At the beginning of last week's lesson (the one in which we jumped) my trainer told me to stop and walked over to me while we were on the left rein. "It's like, you're sitting straight, but your torso is off to the left." She pushed me in the left side of my ribcage. "Holy ****," I said. I was looking down at Connor's neck when she pushed me, and suddenly I could see both sides of his neck evenly. But the thing was, if you asked me before she did that if I was evenly over his center, I would have said yes. This sounds stupid, but I would never have realized that my default position was that off to one side if she hadn't pushed me like that and I hadn't been looking down when she did it. "That's probably part of the reason you have so much trouble with his left bend." 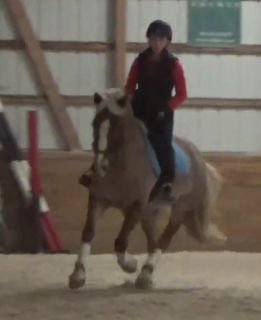 The rest of the ride, anytime I felt him get crooked, I exaggerated placing my torso to the right and making sure to keep my right side long, and he almost immediately softened and got straight. Yea I know that feeling... I'm basically always sitting on the right side. It's a real struggle. That gif says it all. Good post! Haha glad I'm not the only one with body awareness issues. It's hard. Dude, I have no idea where I am in space. It's awful. The struggle is real. My issue is my leg. Trainer is constantly telling me to put my leg back. The thing is, it only really clicked to me when my other trainer told me to do a nose to the wall leg yield and then said "your leg is now on. That's how it should be normally." Oh, ok. Lightbulb moment. Now I understand how it should feel (not that I can magically now keep my leg on at all times, but at least I know what I should he doing and not living in ignorance). Yeah. It's just that there's such a big leap (for me) from identifying something to actually fixing it. This is like when I can't seem to figure out how to get Murray to bend right, and then I actually bend my own torso to the right and suddenly we can bend right. Positioning is hardddd. Yes! And I think I've felt this before, but not this clearly or defined. Its so much harder than it looks isn't it?? That's why i like to have someone on the ground to point out all those little things!! Yes! I never would have figured this out on my own.